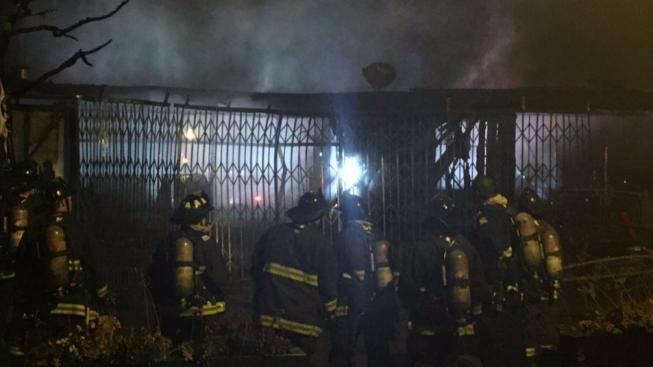 Golfers can once again reserve tee times starting at 7 a.m., with the last tee time at 6:30 p.m.
San Francisco Fire Department crews have brought a two-alarm fire at the Golden Gate Park Golf Course Clubhouse early Monday morning under control, fire officials said. Anser Hassan reports. The Golden Gate Park golf course has reopened after a fire destroyed its 67-year-old clubhouse earlier this month, park officials said. A temporary unit is in place, and though food service is limited, all other services are back to normal at the popular nine-hole golf course at the west end of the park. Golfers can once again reserve tee times starting at 7 a.m., with the last tee time at 6:30 p.m. Golf lessons for young and old have resumed at the course, according to park officials. The San Francisco Fire Department is investigating the fire, which was reported at 2:47 a.m. July 2 at the course.